Based on reviews from 39 experts and 3,577 users. Learn how our rankings work or see our guide to Adidas mid football boots. Updated Apr 2019. Contrary to what most people think, collars in football boots are actually a popular thing even in the past. In fact, the first ever football boot which was worn by King Henry VII was designed to be ankle-high. Fast forward to the 20th century, collared cleats, including the mid top style, continue to shine in football arenas. Adidas Ace Tango 17.1 Indoor - This Adidas mid top football boot highlights the brand’s exclusive Boost technology as its midsole component. It is regarded as a mid-top shoe due to its extra-long socklike tongue that extends to the lower leg. 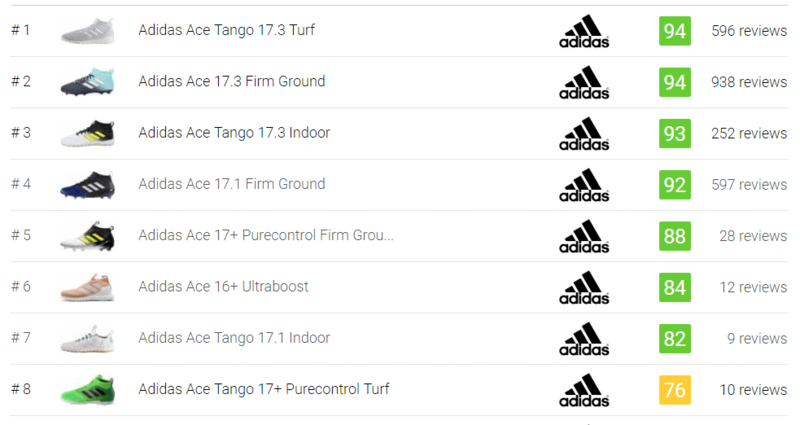 The Ace Tango 17.1 indoor also has a turf counterpart, the Adidas Tango 17.1 TF. Adidas Ace 17.1 Firm Ground - The firm ground variation of the Ace 17.1 is styled with a mid-top collar that serves as a socklike extension to the boot. It is known as the Purecut Control fit collar which has become the lineup’s trademark feature. This Adidas mid top football boot is offered in both men’s and women’s sizes. Adidas Ace 17+ Purecontrol Firm Ground - This laceless football boot carries exactly the same mid top style as its laced counterpart, the Ace 17.1. The Purecut Control fit collar offers an elasticated quality that adds up to the shoe’s comfort quality. This popular model was headlined by the equally famous footballers, Paul Pogba, Dele Alli, Mesut Ozil and Juan Mata. Adidas Ace 16+ Ultraboost - Similar to the Ace Tango 17.1, this street football boot is fitted with the Ultraboost midsole. The combination of the mid-height collar and the midsole foam technology gives the Ace 16+ Ultraboost a contemporary feel. This Adidas mid top football boot also comes with a Primeknit upper that allows a form-fitting and breathable sensation. Adidas Nemeziz 18+ Firm Ground - Released in time for the 2018 World Cup, this Adidas mid top football boot is a remodeled version of its previous generation, particularly around the collar area. This Messi-inspired cleat has a slightly raised collar on the lateral side in comparison to its predecessor, the Nemeziz 17+ FG. The Nemeziz 18+ FG still features the series’ trademark Agility Bandages but with an added mesh element to it. Adidas Nemeziz 18.1 Firm Ground - The Nemeziz 18.1 FG is the laced counterpart of the 18+ model. Built to provide stability, this Adidas mid top football boot is also wrapped with Agility Bandages which was inspired by the practice of sports taping. The Agility Weave on the forefoot area is an updated feature for this model. It aids in enhancing ball touch. Adidas Nemeziz Tango 18.1 Trainers - These mid top trainers feature an eye-catching Nemeziz silhouette with the Agility Bandages tainted in the debut colors, Zest and Core Black. The Nemeziz street shoe is also styled with a laceless forefoot. Similar to its firm ground and indoor variation, the Nemeziz Tango 18.1 TR is styled with uniquely shaped mid-height collar made of Agility Bandage. What is the difference between high top football boots and mid top football boots? Mid top football boots are styled with a socklike collar that are on the ankle level while high top cleats offer more coverage as they are designed to be above the ankle. In general, these terms are used interchangeably. Here are at RunRepeat, we follow the previously said distinction between the two collared boots. What other brands offer mid top football boots? Apart from Adidas, Puma is also a staple name in the lineup of mid top football boots. Although Nike also offers mid-height collared boots, they label these boots as high-top. The Puma One 18.1 FG/AG and Puma Future 18.1 FG/AG are just some of the popular Puma boots that are fashioned with a mid-cut collar. Does Adidas also offer high top football boots? Yes, Adidas offers high-collared football boots in the form of the well-known Predator lineup. The Adidas Predator cleats are styled with a collar that is higher than the ankle level. This style is suited for fashion-forward players who prefer to have more coverage on the lower leg. Are mid top football boots recommended for a specific player position? Choosing the height of your football boots boils down to personal preference. There is no specific requirement or recommendation for any player position in terms of the collar height. Mid top football boots are suited for any type of role so long as the player is comfortable with having a socklike sensation in the ankle area. Are the Adidas X football boots considered to be mid top football boots? Here at RunRepeat, most of the X football boots are regarded as low top football boots. Both the 2017 and 2018 models are considered as low top due to the shape of its collar that does not offer coverage on the ankle area. Although the front and rear parts of the collar are slightly raised, the ankle part is not covered. Adidas mid top football boots are cleats with collar coverage on the ankle level. How will you know if a football boot is already considered high top? If the height of the full collar goes beyond the ankles, the shoe is considered a high top football boot.